Boundaries exist in every relationship in the world. Usually unspoken and often unclear. Yet we know for sure when they are crossed. We feel it. Everyday we face boundary choices in relationships. In a conflict, how do I know who is right? Should I help every person who asks me? Is it ok for me to ask for help? Is this behaviour acceptable to me, in this situation, with this person? Should I compromise? Always? Never? You own your own life. You get to make these decisions for yourself. You’re welcome / I’m sorry. The good news is, if you know yourself and what matters most to you, you will know what you want in any situation. 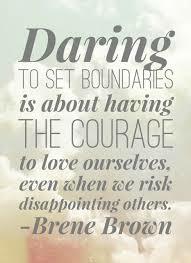 In other words you will know where the boundaries are for you. Learning to voice your decisions and stand by them… well, that’s a process for most of us! It is an essential skill though, if you want to create healthy relationships. It is much easier to set a boundary with someone if you are clear about your priorities are and comfortable with them. Saying ‘no’ is much easier if you know what you are saying ‘yes’ to instead. For example, a boundary about what is acceptable to you: ‘Please don’t make prejudiced remarks around me’ is easier to say when you remember you are saying yes to equality and respect. Or boundaries about what you will do: ‘No, I can’t help you with that at the moment, I’ve got some very important snoozing to do for myself. You are saying yes to your priorities. Even just voicing your priorities to yourself can make it easier for you to be clear with other people. Be clear. Be kind. Be firm. Practice is the way to become comfortable with setting boundaries. One of the gifts in having ME/CFS for so many years is the amount of practice I have saying no. I’ve had to say no to so many people because I simply don’t have the energy to do whatever I’m invited to, it has become relatively easy. I no longer waste an ounce of energy feeling guilty for honouring my priorities. The other side of this is I’ve realised it’s not a problem when people say no to me – I assume they have their own good reasons and I’m glad they are honouring their priorities. Finally, if you are worried you might be letting someone down or hurting their feelings, it is well worth remembering this: the people who love you will still love you, no matter what choices you make. And as for trying to please people who don’t love you, well, is that any way to spend your life?